Even seasoned Glacierites have new places to explore and unseen vistas to discover inside the park. Check out our list below and let us know what other new activities you’re dying to try! As the Earth hurtles through space, each year it circles around to pass through the tail of the comet Swift-Tuttle, leading to an astounding light show in our dark skies. This year in particular, the path is crowded, meaning more debris will hit the atmosphere and flame into brilliant meteors. The peak viewing time is the night of August 12, but expect to see shooting stars as late as August 24. Head up to Logan Pass this month and experience the magic free of light pollution. While the Going-to-the-Sun Road restrictions on bicyclists mean it’s closed to riders between 11:00am and 4:00pm, other spots in the park remain prime peddling for cyclists even during the busy months. One such spot is the Inside North Fork Road, still partially closed to vehicles due to flood damage, but open to bicycles and hikers. Experience the beauty of this untouched section of the park without cars. Come ready with mountain bikes, available for rental at the lodge, and enjoy an off the beaten path adventure. What better way to enjoy the beauty of this stunning environment than with like-minded photo philes? Round up for an InstaMeet to meet new friends, locals and visitors alike, and capture unforgettable moments in the park. 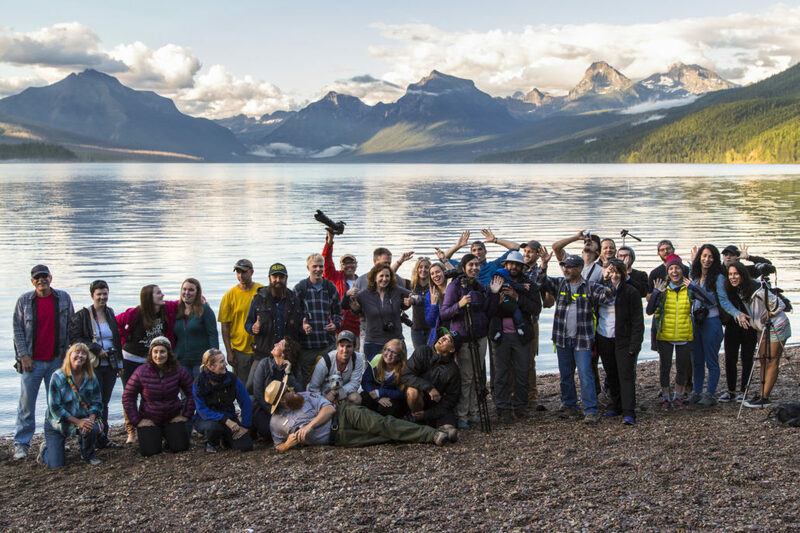 InstaMeets gather at the major hubs of the park meeting at Lake McDonald, Logan Pass, St. Mary Lake, Two Medicine, and Many Glacier at various times throughout the season. Whether you have a full-blown DSLR or a flip phone camera, come ready to create beautiful images. Follow it up with a paddle on the lake to experience the park from a new angle. Click here for upcoming InstaMeet dates! Learn about the geology of Glacier, get photography tips from the pros, or investigate local wildlife in a fun and educational environment. With great options for kids and adults, get the whole family involved in Glacier Country to support education in the wild! Head down to the Apgar Campground Amphitheater, only 15 minutes from the lodge, and embrace a new perspective from members of the Salish, Pend d’Oreille, Blackfeet, and Kootenai tribes who impart traditions and histories to share their cultures with park visitors. Get in early to be sure to find parking and good seats, and then enjoy the 45-minute presentation! Click here for a peek at the August schedule.